Pittsburgh, PA- The University of Illinois at Chicago (UIC) Office of Sustainability staff, undergraduate students, and graduate students present lessons learned and expertise at the annual Association for Advancement in Sustainability in Higher Education (AASHE ) Conference October 2-5, 2018. With a theme of “Global Goals: Rising to the Challenge” AASHE 2018 examines the critical role of higher education in achieving the United Nations Sustainable Development Goals (SDGs). Adopted by the world’s governments in September 2015, the 17 SDGs establish ambitious global targets to end poverty, protect the planet and ensure prosperity for all by 2030. Sarah Koning (Sustainability Fee coordinator) and Joanne Moliski (Graduate student, CME) explore the question, "What About Accessibility? The Intersection of Sustainability and Accessibility on College Campuses" during their 30-minute presentation on October 4. In this panel, they begin a discussion about where and how sustainability and accessibility initiatives work together and intersect in meaningful ways in higher education. They pose these questions to the audience: 1. Does your department currently have a relationship with the disabled community on campus? 2. Are there any projects that can advance accessibility through sustainable means? 3. Have you had any projects unintentionally conflict with accessibility needs? If so, what are some lessons you learned from the experience? Cindy Klein-Banai (Associate Chancellor for Sustainability) presents on a panel to discuss "The Role of Campuses in Driving Climate Resilience Planning" with presenters from Dickinson College, UCLA, and Second Nature on October 4. Cindy and her colleagues discuss how their schools are serving as models of climate resilience planning and developing relationships with the community, particularly in the context of global initiatives such as 100 Resilient Cities and the Sustainable Development Goals (SDGs). The presentations and discussion address questions about how higher education institutions can align their teaching, research, campus operations and cross-sector collaborations in support of SDGs for sustainable cities and communities, climate action and partnerships for sustainable development. 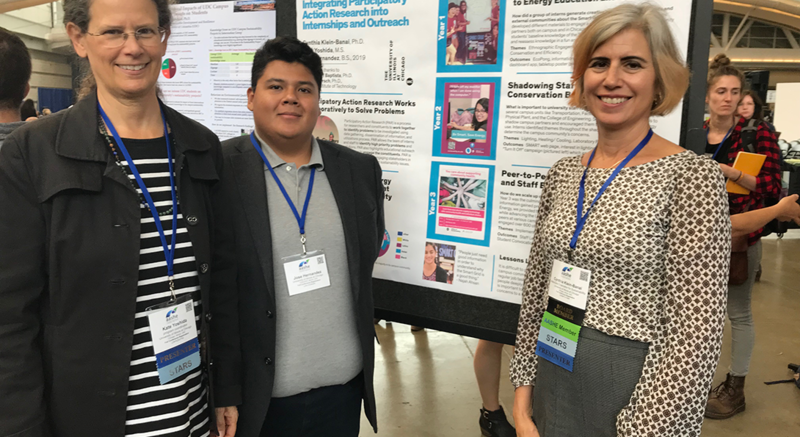 UIC student and Smart Grid Intern Jose Hernandez, along with Cindy Klein-Banai and Kate Yoshida (Sustainability Program Coordinator), present the topic "Integrating Participatory Action Research Into Internships and Outreach" on October 3 during a poster session. The poster explores the case study of the Smart Grid internship over the last 3 years, examining the Participatory Action Research (PAR) methods in the context of UIC's sustainability internship program focused on providing information about energy, conservation, and new "smart" grid technology to the campus and community. The Year 1 program included a train-the-trainer piece using education and outreach to engage our student body, Year 2 students expanded their understanding of a number of campus units, departments and organizations whose core-work, mission and values already align with sustainability issues, especially as they relate to energy use and conservation, and Year 3 was the culmination of the first two years with a student-focused events to engage students, hosting learning lunches with campus departments, and remaking of the concept of an energy saving competition into a quiz. AASHE defines sustainability in an inclusive way, encompassing human and ecological health, social justice, secure livelihoods and a better world for all generations. AASHE is a member-driven, independent 501(c)(3).